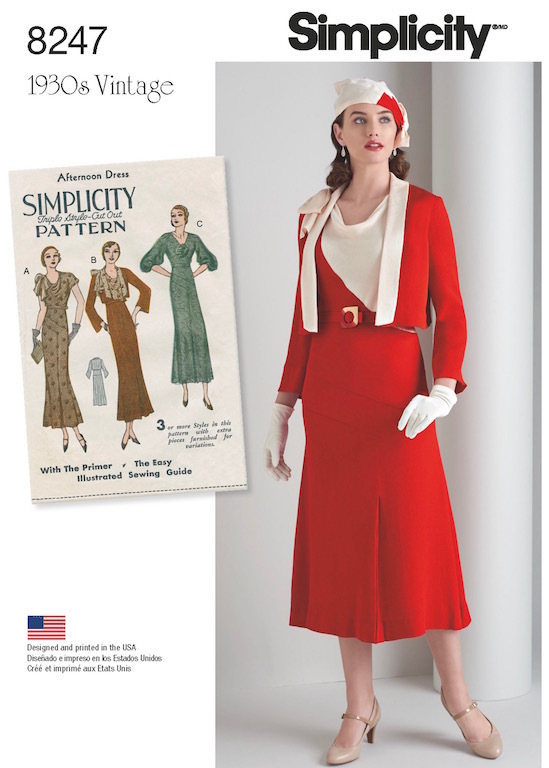 After the release of the last Simplicity pattern catalog back in August, I had a feeling that there would be few, if any, vintage reproductions this time around. Boy, was I wrong! I am not sure what is going on over there, but someone is clearly a fan of vintage, which is making me very happy! Now if only they would fix that darn website (if you were wondering, an Instagram post from Pattern Review is what alerted me to the new designs). 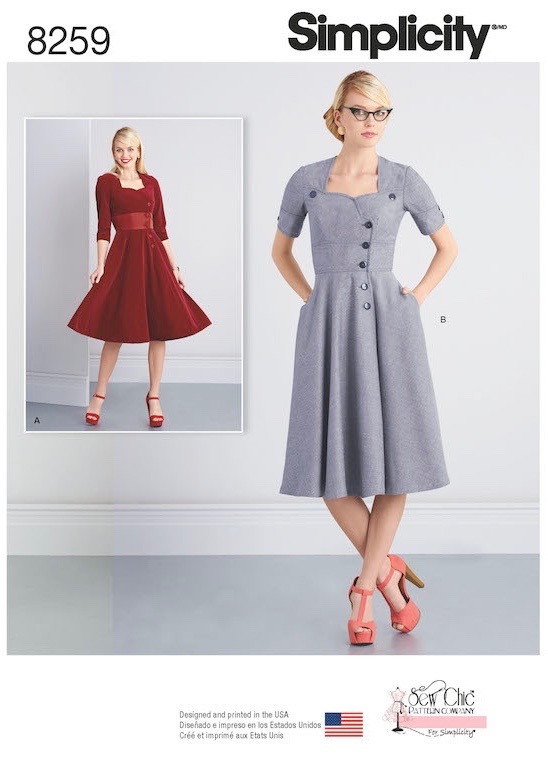 Choosing a favorite is difficult, but I think I am going to say Simplicity 8248. I love that Simplicity is reaching further back in the archives and including some 1930s options. There are so many wonderful choices from that era, and this is a wonderful example. This 1960s reproduction brings up a few questions for me. If you look at that original vintage envelope, you will notice that the design is labeled "Designer Fashion." So it would seem that Simplicity is not barred from reproducing designer patterns when McCalls continues to say that they are. 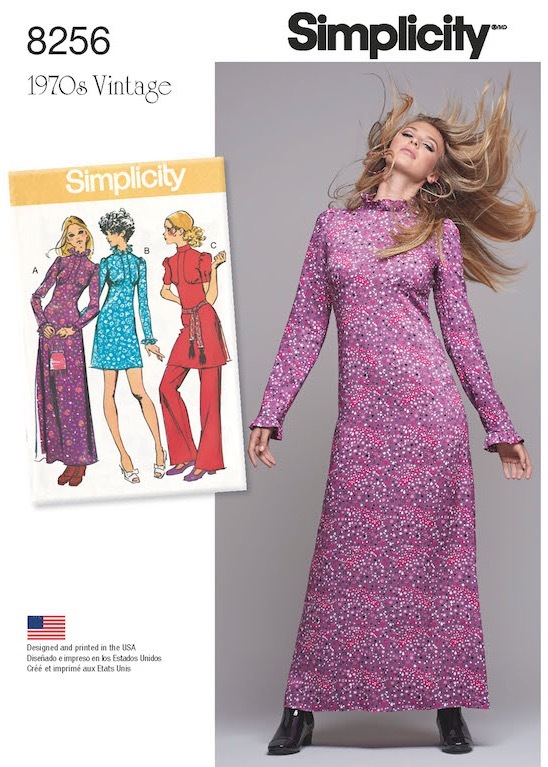 I have never really noticed the “Designer Fashion” pattern line from Simplicity. It appears that most of them are from the 1960s and 70s, which may explain why I was unaware of the category since I tend to obsess more over the earlier fashion decades. After a bit of internet "research," it turns out that I actually have one of these patterns in my stash and I did not realize it was a designer copy. What I want to know is what is in the bonus "Designer Touch leaflet" included in the pattern that you can see mentioned in fine print. How wonderful would it be if the reproductions include some of that information!? Alas, my 1974 Designer Fashion pattern does not mention a leaflet, nor does it include one. Do you think they included special sewing techniques, or perhaps styling tips? 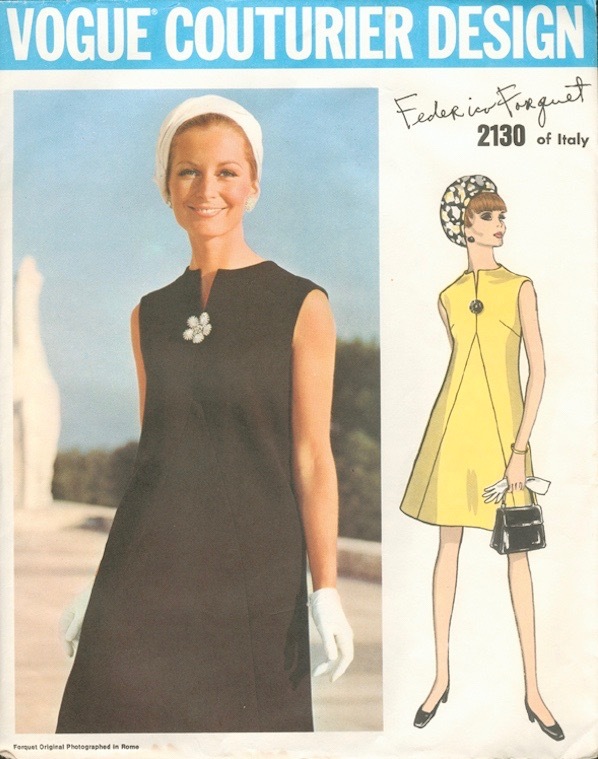 Adding to the mystery is that this design looks suspiciously like a 1969 Vogue Couturier pattern from Frederico Forquet. Looks pretty similar, right? The Simplicity Designer Fashions make no mention of the actual designer, although I think this particular one may very well be Forquet. Perhaps the fact that no name is mentioned is what makes it possible to reproduce them? But how about that photograph that they have included on the pattern envelope? Enquiring minds want to know! I wish the Vintage Vogue line could find a work around for this issue, because there are certainly quite a few patterns I would love to get my hands on (Schiaparelli, Grès, Balmain, Patou, and Heim just to name a few)! Moving on . . . this 1930s outfit will definitely be on my to-do list, provided I can find a suitable fabric choice. Look at the buckle on that red and white dress, though! And the hat with the red accent - well done, Simplicity. I am going to give them a pass on the shoes because the rest of this is so very wonderful. 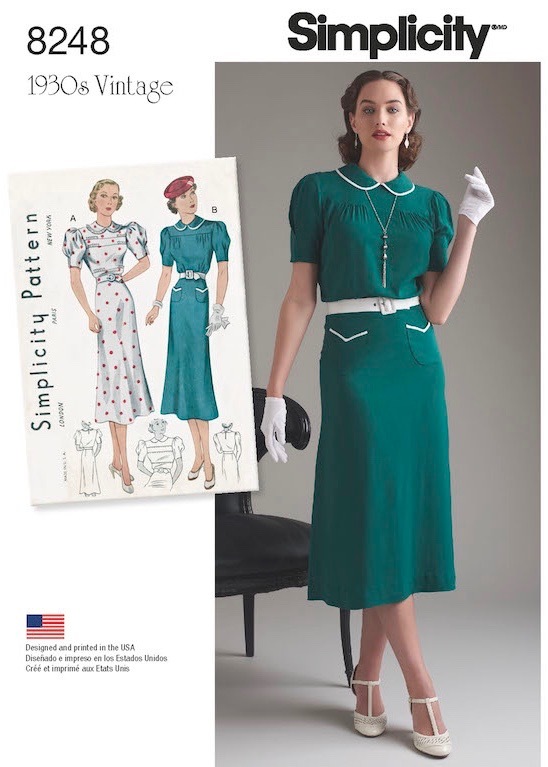 I do like the look of the illustrated version of Simplicity 8249, although the example was obviously made for a significantly shorter individual than the model. Look at where the darts sit, and the hand on her waist looks over an inch lower than the waist seam - someone forgot that length can be just as important as width when it comes to fitting, which is a shame, because I think she is an excellent model choice for the vintage looks. On the plus side, I have been complaining about lack of details and the overall "simplicity" of the vintage reproduction designs, but this time around, I am very pleased with the options! Those lovely tulip sleeves and those diagonal gathered sections are beautiful! But again with the shoes . . . just Photoshop it in later if you have to. The same sizing issue is happening with the skirt and bolero pattern. The model’s version is much too small. It looks like she might have fairly broad shoulders, so hopefully the pattern is not drafted in such a way that it does not match the original illustration which covers more of the bust area and fits more like a jacket. 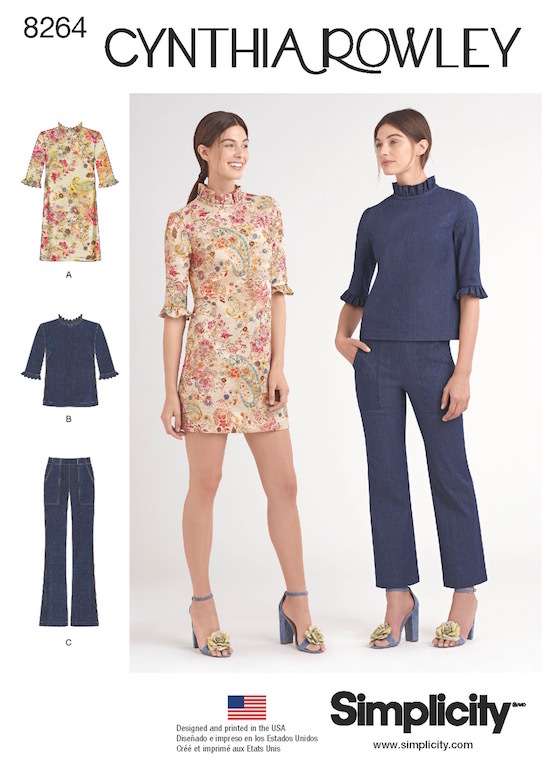 Most of the Simplicity vintage reproductions I have worked with have been significantly shorter than an original vintage pattern would be - this does not seem to be the case here, so hopefully they are giving us a more true draft of the original. At least they gave this poor girl one garment that fits properly. This dress with collar and cuffs is adorable! The dropped shoulder lines are not something that I have tried before; I wonder if this could easily look like a fitting mistake. But this design may be inching its way to the top spot for me. I am going to have to go digging in the stash for an appropriate length of wool. And again, it looks like this dress hemline has not been shortened! This 1950s design with the redingote is also one of my top choices. Look beyond the polyester chiffon, and there are some great style lines happening. Simplicity really is making an effort to make the samples look like the original illustrations. Some are more successful than others, but I do like the way it pulls the cover art together. I am curious about those contrast panels in the red illustration. They are probably just applied lace which is then gathered, but I wonder if there are separate pattern pieces involved. The Pre-Raphaelite obsessed high school girl in me would be all over the full length version of Simplicity 8256, but I am not sure this is my cup of tea these days. It does remind me that I have a dress with hand made crocheted trim languishing in a bag somewhere that looks a bit similar to the short version. I think I cut the lining out wrong and got frustrated and ditched the thing. I wonder what I did with that project . . . because I haven't come across it in YEARS! This Cynthia Rowley design has a similar feel, although more simplified. I think large part of why I am drawn to this is those fabulous shoes. 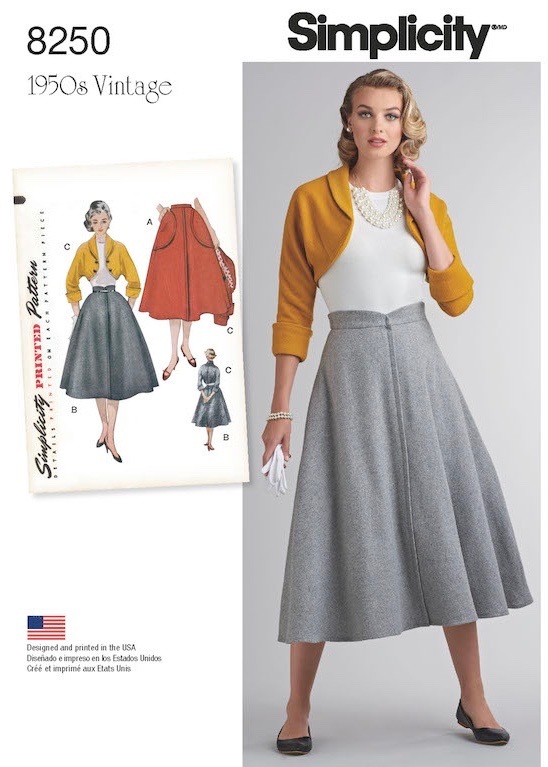 Sew Chic has another adorable design added to the Simplicity catalog with a definite vintage flair. I love that asymmetrical button closure. 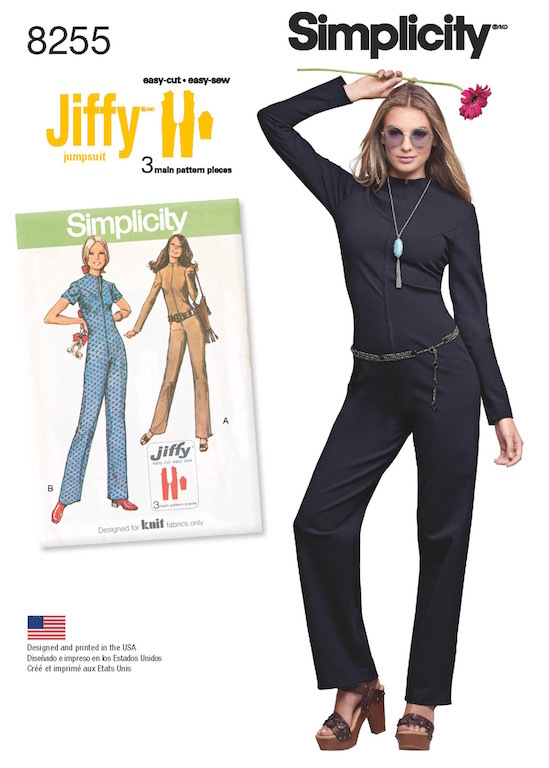 There is another 1960s simple Jiffy shift option (it seems like there is at least one in every catalog), which think I will pass on, but how about this jumpsuit for one of you out there blessed with long legs! There is something about that blue illustrated version that I keep coming back to - it's probably the fact that I always wanted to be six feet tall. That ain't gonna happen, so I think I need to keep away from this design. And now I feel like I have posted the entire catalog. Well, not quite, but there is certainly an abundance of great designs being offered. Thank you for that, Simplicity. But I still think you should do something about that website. Or maybe it's not necessary because no one buys patterns directly from simplicity.com? I know I will certainly be paying a visit to JoAnn Fabrics the next time there is a sale! This was such an exciting release to discover on Instagram, especially since Simplicity has been so far off my radar in the last few years. I love the 40's gown... despite seriously being over making gowns! I love these designs! I don't often go to the Simplicity website because it is so bad, but I'll have to now! Thanks! Are you not 6 feet? For some reason I thought you were, or quite close, anyway. Just the way you style your photos and the types of clothing cuts you sew make you seem very tall and elegant, I suppose. I bet you could pull off a jumpsuit like that fantastically well, at any rate! I am using PatternReview.com - as with all of the releases since Simplicity updated their website, the company is really, really slow about updating their catalog info. The only way to see the new stuff for the first few weeks after a release is by using another website like Pattern Review. I have also heard that the patterns are already in stores like JoAnn Fabrics and Hobby Lobby, so presumably, the new catalogs are there as well. There was also a new capelet pattern 8263 that has a vintage feel to me. I added it to my wish list along with 8248 which I am LOVING!! 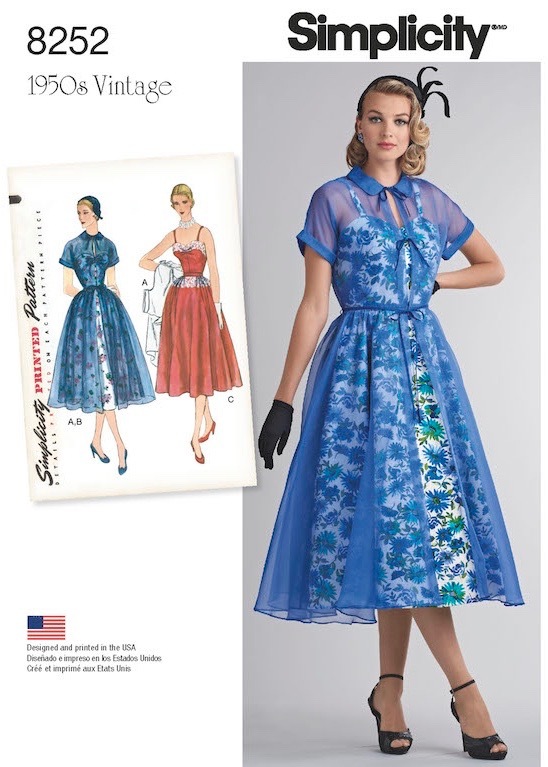 Love, love your review of vintage patterns! 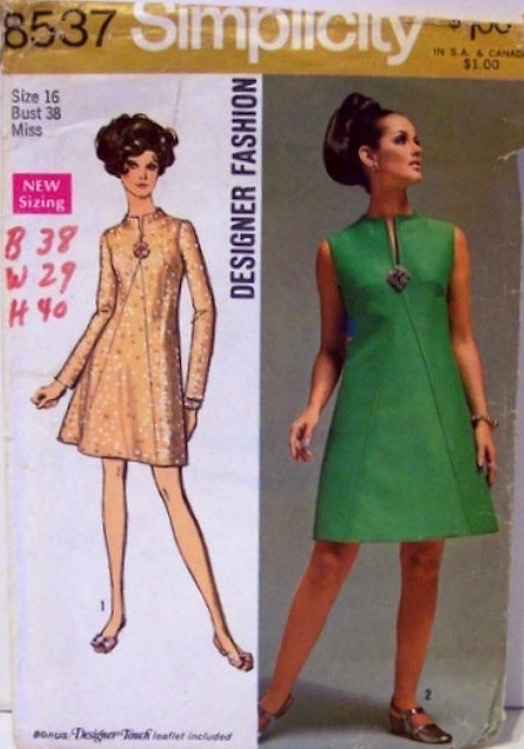 I've seen that Simplicity 8254 (60's shift) isn't the only Designer's pattern reprinted this time around. 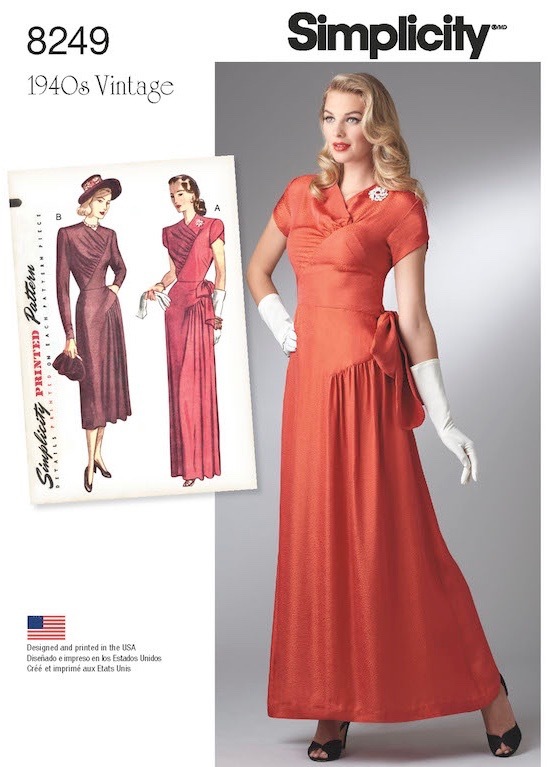 Simplicity 8252 (the Redingote with underdress) was originally a Designer’s pattern, no. 8270 from year 1950 or 1951. 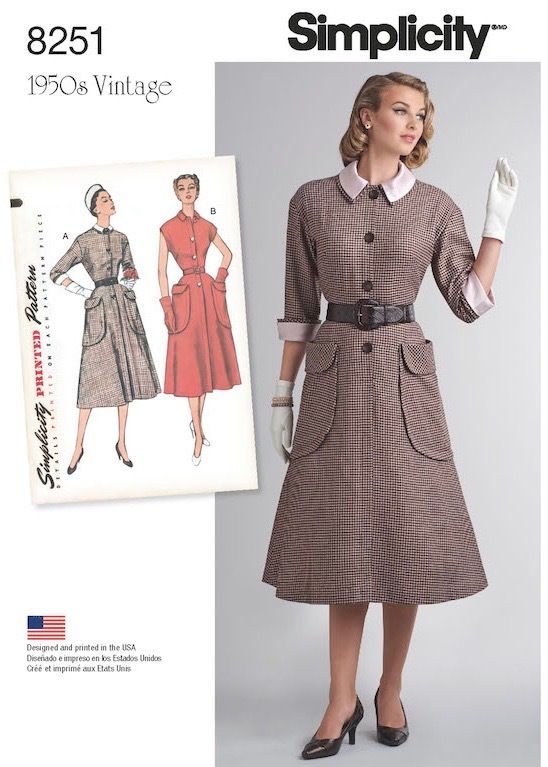 Also, Simplicity 8251 (button front dress with double collar and cuffs) was originally a Designer's pattern no. 8364, year 1950. I sure hope more of these special patterns get reprinted!